Exclusive Classical Music recorded in Spain's large Cathedrals and Churches ! With pictures from "Making of" and some very enticing photographs from the regions where has been recorded. All our published recordings are existing thanks to the private initiative of Michael Reckling. The music of this site can NOT be used for commercial purposes or any public reproduction. © 2014 - All rights reserved by Michael Reckling - Valladolid - Spain. the Major Sun Organ "Órgano del Sol Mayor" in Marbella / Southern Spain. using one of Spain's largest and finest church organs, the grand Blancafort Organ: Órgano del Sol Mayor. of Marbella, famous holiday resort in Andalusia, Southern Spain. PRELUDE & FUGUE in G major BWV 541 by Johann Sebastian Bach, performed by PILAR CABRERA (Spain) on the new Organ at Valladolid's Cathedral in Northern Spain. PILAR CABRERA (Spain) on the new Organ at Valladolid's Cathedral in Northern Spain. of the city of Marbella, famous holiday resort in Andalusia, Southern Spain. famous holiday resort in Andalusia, Southern Spain. TOCCATA & FUGUE in f major (Dorian) BWV 540 / by Johann Sebastian Bach, performed by J.R.W. performed by Pilar Cabrera at Valladolid's Cathedral. Live recorded during the Autum Concert at Valladolid's Cathedral on September 29, 2007.
the famous holiday resort in Andalusia, Southern Spain. performed by PILAR CABRERA (Spain) on the new Organ at Valladolid's Cathedral in Northern Spain. 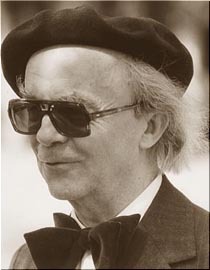 Samples and pictures of JOSÉ MANUEL AZKUE. on the grand Blancafort Organ "Organo del Sol Mayor" at the Main Church of the city of Marbella. the most famous holiday resort in Andalusia, Southern Spain. with on of the first black/white video equipments Akai VR-110. PILAR CABRERA (Spain) performing on the new Organ at Valladolid's Cathedral in Northern Spain. live recording during Pilar Cabrera's Easter Concert 2007 at Valladolid's Cathedral. TRIO SONATA Nr. 6 in G major - BWV 530 by Johann Sebastian Bach, performed by PILAR CABRERA in 1986 at the Grand Marbella Organ "Organo del Sol Mayor at the Main Church of the city of Marbella in Southern Spain. CD's of all Organ Concerts, celebrated at Valladolid's Cathedral (Spain) between 2006 and 2014.
of the wine village Cubillas de Santa Marta in the region of Castile & León in Northern Spain. Pilar Cabrera at Bruges Cathedral in Belgium. Live recording of the complete Organ Concert. Pilar Cabrera at Brussels Cathedral in Belgium. From Nicolas de Grigny's "Premier Livre d' Orgue"
Live recording of his organ recital on 31st of July 1987 in Marbella's Main Church. performed by PILAR CABRERA and JAVIER VILLERO at the grand Marbella Organ, 1986.
on the new Organ at Valladolid's Cathedral in Northern Spain. 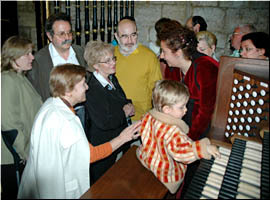 PILAR CABRERA (Spain) in 1986 at the Grand Marbella Organ "Organo del Sol Mayor". 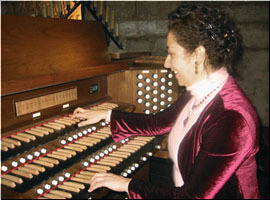 PILAR CABRERA (Spain) at the new concert organ of Valladolid's Cathedral. on 31st of July 1987 in Marbella's Main Church. Live recorded by Michael Reckling on April 28th, 2007. An excellent performance with a great instrument and wonderful acoustics ! Live recorded during Valladolid's Spring Concert on April 28, 2007.
performed by Pilar Cabrera at the new Brussels Cathedral Organ. Live recorded during one of Pilar Cabrera's summer recitals. Here 3 samples live recorded during one of Pilar Cabrera's summer recitals at Valladolid's Cathedral. at Valladolid's Cathedral. Live recording of the Summer Concert 2008. Pilar Cabrera at Valladolid's Cathedral. Live recording of the Summer Concert 2008. ROYAL FIREWORKS MUSIC by Geor Friedrich Händel, 1� movement: "REJOUISSANCE"
performed by PILAR CABRERA (Spain) at the new concert organ of Valladolid's Cathedral.